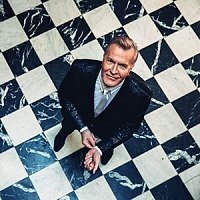 Martin Fry and ABC's brand of theatrical New Romantic pop surely will find no better home than behind the grand colonnade of Benjamin Dean Wyatt's imposing Theatre Royal on Drury Lane. The space inside is just as impressive as the frontage and, boasting more than 2,200 seats, is one of the three largest theatres in the West End. A suitably grand setting then for a celebration of one of the definitive albums of the early eighties New Romantic movement, ABC's The Lexicon of Love. Themselves fronted by the towering Martin Fry, complete with shiny suit, flicked fringe and just a hint of mascara, ABC delivered a debut record of enormous relevance and enduring success. Produced by Trevor Horn, The Lexicon of Love boasts a handful of smash hit singles including Poison Arrow, Tears Are Not Enough, All of My Heart and The Look of Love (parts one and four). It was a concept record, charting the protagonist's continuing heartache, and the public loved it. It was, of course, a chart-topper here and also made No 24 on the US Billboard countdown. It remains a peerless standard in New Wave English pop. ABC will be breathing new life into The Lexicon of Love at the Theatre Royal in Drury Lane, one of the West End's largest theatres, on Tuesday 18th December 2012. We will have tickets available from 10am on Friday 7th September, priced £35.